A gorgeous bouquet in soft pastel colors! This luxurious bouquet of roses, lilies and hydrangea in spring shades of pink, peach and green is perfect for any special occasion! A complimenting ribbon adorns the clear cinch-waisted vase. 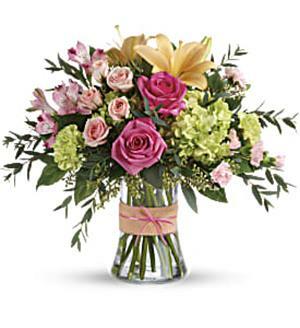 This arrangement features green hydrangea, hot pink roses, pink spray roses, peach asiatic lilies, pink alstroemeria, green carnations, pink miniature carnations, seeded eucalyptus, parvifolia eucalyptus, and lemon leaf. Delivered in a glass gathering vase. Approximately 19 W x 16 3/4 H Flowers and containers used are subject to seasons and availability. Some substitutes may be necessary.